I want join, but my brother signup first without refferal. I want join, I scared buy refferal, i buy much refferal from bux site. Always die refferal and inactive member. No replaced refferal die. 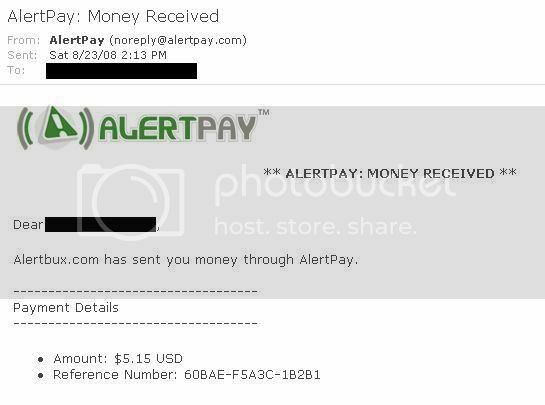 For admin alertbux you accept other alertpay email if i purchase with my email. Different with account and replaced die refferal? I know about bad experience for buying referrals. I was there. Done that. I got DEAD/inactive referrals most of the time. NO more buying referrals for me. So I click solo most of the time now. If I was lucky, i'd get one referral. Right now, there are two problems in PTC fraudustry: sites that sale bots (owners' goal = members earn, sometimes quick, but profit is as low as possible) and sites filled with inactive members. Only around 1/5 - 1/4 of the total members of bux sites are generally active, and the average of active members on Aurora script sites is usually lower than 10 %. If you're not satisfied with purchasing referrals, then try other ways to build your downline.